*The body of St Rita of Cascia is enshrined on the left side of the nave of this church. 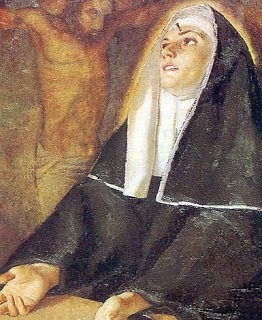 She was a wife and mother who later in life upon her husband’s death joined an Augustinian convent. In marriage she suffered greatly from her abusive husband. Thus today she is the patroness for all who suffer from abusive relationships. *A grotto honoring Our Lady of Lourdes is also located within a small room immediately on the left after entering.